Drape your clients with the luxurious feel of 100% Double Brushed Polyester that are light weight and soft as silk. The perfect addition to your massage and spa table with the ultimate in quality, comfort and durability. These massage sheets are wrinkle resistant right out of the dryer and resist pilling. Mix and Match your massage table linens to create a color scheme that works with your room. See the complete NRG massage Linen Collection to find your perfect pairing. Collection includes , , , , , and . Avilable in White, Natural, Dark Chocolate, and Ocean. Contains 1 flat massage sheet (63" x 100"). 120 GSM (Grams per Square Meter). 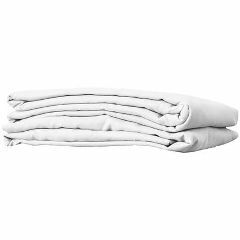 Massage Linens that have been exposed to oil based products can be combustible. Clean massage linens thoroughly before putting in dryer. Heat from sources such as dryers can cause fire during drying and even after removal from the dryer if linens are not cleaned properly. Consult dryer manufacturer's guidelines for drying and storing linens that have been exposed to oils. Machine wash warm, no bleach, tumble dry low, low heat iron, do not dry clean. To keep your sheets free of oil stains we recommend washing them as soon as possible (within 24 hours). If you wait longer it will cause the oils to set, making them more difficult to launder. For badly stained massage linens, presoak or pre-treat with a commercially available de-greaser or stain remover. * Wash in warm water and then rinse in cold. Avoid using hot water as this can cause oil stains to set and become rancid. If sheets still smell of oil after laundering DO NOT put them in the dryer, pretreat and launder again before drying. We recommend using or as these products are specially formulated to help break down oils without the use of harsh chemicals. *Pre-test de-greaser or stain remover in a small area of the sheet before using.